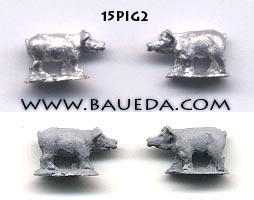 15mm metal figures AVAILABLE NOW! 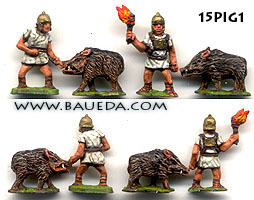 The Romans learned the use of incendiary pigs from the Greeks, it seems they were covered in tar before the battle and kept tethered by a nose ring until ignited. 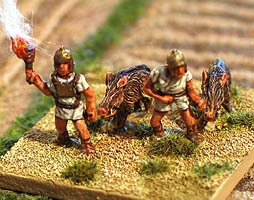 Unfortunately the sources do not tell us much about the kind of pigs that were used for this purpose, but we know that domestic pigs were much valued and very expensive, and that there was an abundance of wild boar available. Given also the more aggressive nature and larger size of wild pigs and the fact that the tar would stick better to their long hairs we have favored these. 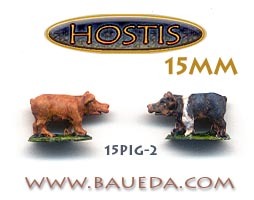 If you prefer to use domesticated pigs instead just get a pack of 15PIG2 to replace the boar with! 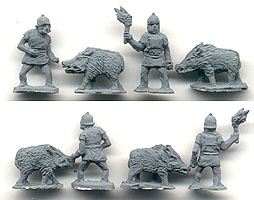 Each pack contains 4 figures, 1 each of two different pigs and two handlers poses. All figures are sold unpainted! 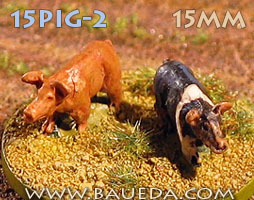 These little piggies can add variety to the incendiary pigs set, providing alternative "missiles" in the form of domesticated pigs. Apparently they make great presents for girlfriends as well, and they could of course be used also in a more conventional way, for example as baggage for your army! Each pack contains six domestic pigs and no handlers. All figures are sold unpainted!